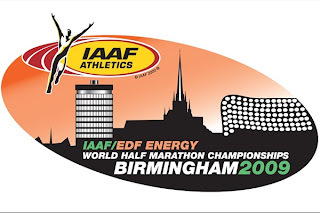 Monte-Carlo – A total of 47 IAAF Member Federations are set to compete this coming weekend at the IAAF / EDF Energy World Half Marathon Championships in Birmingham, UK on Sunday 11 October. This year’s entry is the best since 2004, though the record number of Member Federations that have taken part in this IAAF World Athletics Series event was 60 in the 2002 edition which was held in Brussels, Belgium. Britain last held the IAAF World Half Marathon Championships in 2001, when 52 territories from around the world sent athletes, and also hosted the inaugural edition of these championships on Tyneside in 1992, when 36 federations participated. However, Sunday is not be just about the elite end of our sport as staged 30 minutes after the gun goes for the men’s World Championship race, the EDF Energy Birmingham Half Marathon will take place. The first edition of this mass race that is organised by Birmingham City Council and sponsored by EDF Energy was staged in October last year attracting nearly 9000 entries. The Hyatt Regency Hotel which overlooks the start of all of Sunday’s races is the HQ for the World Half Marathon, and as well as hosting the IAAF Press Conference on Saturday (10) will be the centre of many discussions and debates surrounding our sport. AIMS, the Association of International Marathons and Distance Races - click here - who work with the IAAF on matters relating to international road races will hold a three-day Board Meeting at the hotel (Wed 7 and Fri 9 Oct). AIMS is a member based organisation of more than 270 of the leading distance races in the world. A Course Measurers’ Meeting will be held on the Saturday afternoon, while after the races on Sunday a meeting of the IAAF Road Running Commission will round-off a busy period of sporting action and discussion in Birmingham.